Monarch Air Group provides private air charter in El Monte, CA. Our clients benefit from top-notch service, unrelenting dedication to safety, wide selection of aircraft, and years of experience in chartering private jets. To obtain a free quote, please use our online quoting tool provided below, or call toll free 1-877-281-3051. Monarch Air Group provides private jet charter flights in and out of El Monte, California, USA. El Monte is a commercial, industrial, and residential city in southwestern California, east of Los Angeles. It is the 51st largest city in California, and the 228th largest city in the USA. The nearest airports are Long Beach Airport (LGB / KLGB), which is located 25 miles from El Monte, LA/Ontario International Airport (ONT / KONT), which is located 26 miles from the city, Bob Hope Airport (BUR / KBUR), which is located 27 miles from El Monte, Los Angeles International Airport (LAX / KLAX), which is situated 33 miles from the city, and John Wayne Airport (SNA / KSNA), which is situated 39 miles from El Monte. 2. APV, Apple Valley, Apple Valley, United States. 3. AVX, Avalon Bay, Catalina Island, United States. 4. BNG, Banning, Banning, United States. 5. BUR, Bob Hope, Burbank, United States. 6. CCB, Cable Airport, Upland, CA, United States. 7. CCD, Century City, Los Angeles, United States. 8. CIB, Ap In The Sky, Catalina Island, United States. 12. EDW, Edwards AFB, Edwards AFB, United States. 13. EMT, El Monte, El Monte, United States. 14. FUL, Municipal, Fullerton, United States. 15. HHR, Hawthorne, Hawthorne, United States. 16. HMT, Ryan Field, Hemet, United States. 17. JBP, Commerce Bus. Plaza, Los Angeles, United States. 18. JDY, Heliport, Downey, United States. 19. 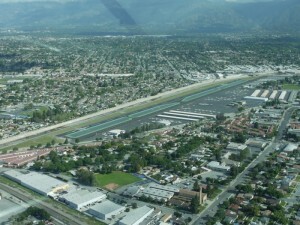 JGX, Heliport, Glendale, United States. 20. JID, City Of Industry H/P, Los Angeles, United States. 1. DoubleTree by Hilton Hotel Los Angeles/Rosemead, 888 Montebello Boulevard, Rosemead. 2. DoubleTree by Hilton Hotel Los Angeles/Rosemead, 888 Montebello Boulevard, Rosemead. 3. DoubleTree by Hilton Hotel Los Angeles/Rosemead, 888 Montebello Boulevard, Rosemead.